Paper Seedlings: LET'S ALL SAY "CELEBRATE"! I am taking part in a Stampin' Up! Paper Pumpkin Boot Camp at this time. We are given lots of challenges to complete during the course of this 6-week program. One is to create examples of projects that can be made using the stamps from bygone Paper Pumpkin kits. The June kit was adorable. It included all the supplies needed to create 24 pinwheels that could be used as a typical pinwheel on a darling red-and-white striped straw, or it could be added to a treat bag, both of which were also included. One of the stamps that came in this kit was the one you see on this card: celebrate. You can watch a cute 1-minute video of the June Paper Pumpkin kit being opened HERE. I had so much fun creating this card because I got to use SO MANY new(ish) Stampin' Up! supplies. 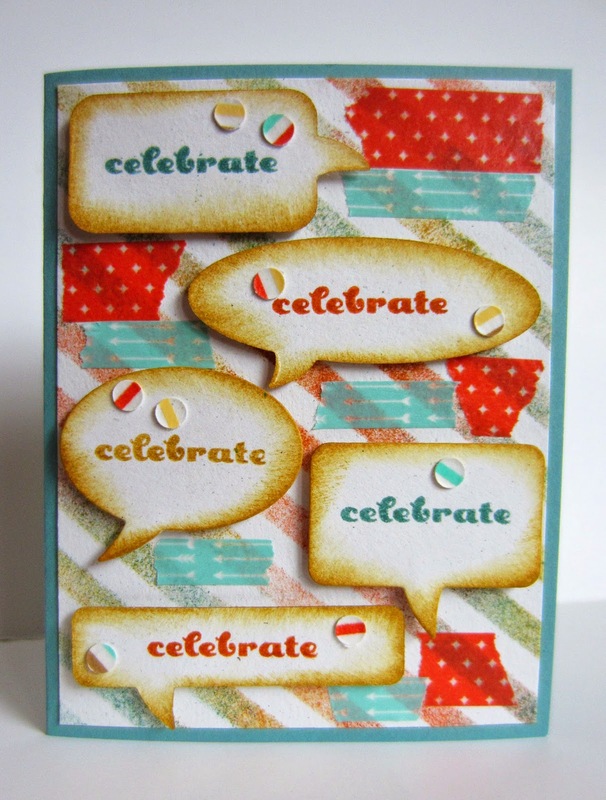 First of all, of course, the "celebrate" stamp came from the June Paper Pumpkin kit. The colors I used to stamp the word are all new In Colors: Lost Lagoon, Hello Honey and Tangelo Twist. The card base is made from the Lost Lagoon cardstock. 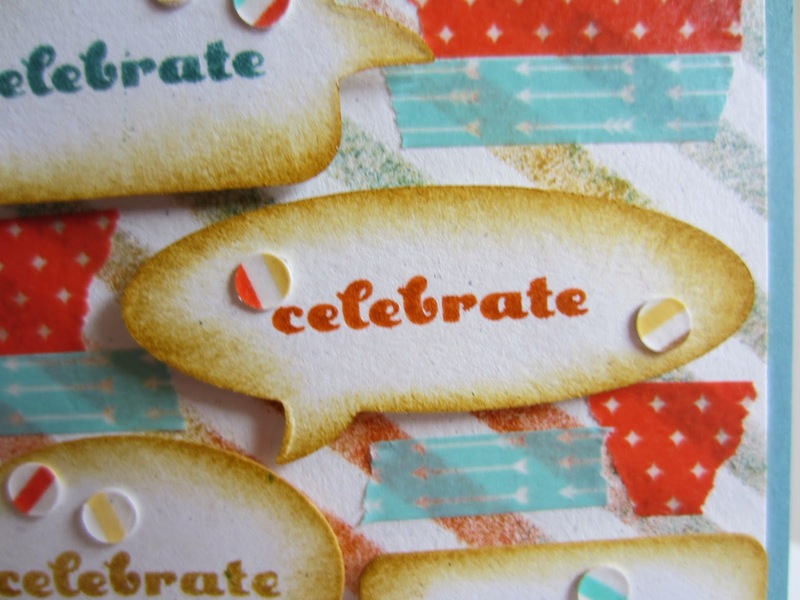 All the "celebrates" were cut out with the Word Bubbles Framelits, then sponged in Hello Honey ink. And then they were popped up with Stampin' Dimensionals. To create the stripes in the background, I used the same inks, sponging them on through the Dots & Stripes Decorative Masks. Even though the colors in the Retro Fresh Washi Tape are not the same as the In Colors, I felt they coordinated quite well. To make the perky dots on the word bubbles, I adhered a strip of the striped Washi Tape to a piece of cardstock and punched out circles with a paper punch. I then glued them to the bubbles. Doesn't it look just HAPPY, like a bunch of people are wishing the recipient to CELEBRATE?!? How have you used any of the stamps from past Paper Pumpkin kits? Aren't they fun to collect? The final challenge of the Paper Pumpkin Boot Camp is to have four new people sign up for Paper Pumpkin. If you would like to help me to meet that challenge, you can sign up HERE for any length of time to receive Paper Pumpkin. Please name me as your demonstrator so I can use your sign-up in achieving my goal. You need to sign up and activate your code no later than Sunday, July 27, in order for it to count for this Boot Camp. Thanks!! I love your card and it is even better in person! I love all the stamps from PP too. What do you mean collect, isn't that sposed to be hoard? That's me of course! What a fun card!! I'll be featuring this today at The Happy Scraps! What a fun creative outlet! I hope the recipient appreciates all your work and thought :) Thanks for joining Pin Your Friday Favorite! Such a cute card! I love the font on the sentiment stamp. Thanks for sharing with Creative Spark Link Party. Those are too cute! I'm always so impressed by your cards. Thank you for linking at the In and Out of the Kitchen Link Party. Hope to see you again next week. Darling! You did a great job! Thanks for linkin up to Sunday FUNday!